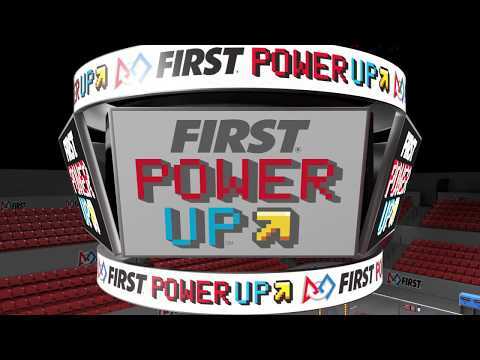 FIRST Power Up, is the FIRST Robotics Competition game for the 2018 season. It involves two alliances of three teams each. The game has a retro 8-bit theme and teams are required to place milk crates, or "power cubes", on large balancing scales to tip the scale and gain ownership. Alliances can also trade power cubes for power ups, giving them a temporary advantage in a match. At the end of the match, robots can climb the tower attached to the centre balancing scale using a rung attached to the tower, giving them additional points. Team 1114, Simbotics entered the 2018 season with simplicity in mind. The district season proved to be a difficult one for 1114 running into mechanical issues at key moments. Simbotics started off the year strong winning the Ryerson University District event, while taking home the Excellence in Engineering Award. After changing the design of their intake, they ran into mechanical issues at the Windsor-Essex Great Lakes District event making an early exit in the semi-finals. Heads were held high as they didn’t go home empty handed. Simbotics was recognized for their support of other teams throughout the event, winning the Gracious Professionalism Award. They came out strong at the Ontario Provincial Championship with a solid qualification round, unfortunately they fell just short to a very strong alliance in the Technology Division finals. The judges awarded the team with the Innovation in Control Award for their fine tuned autonomous modes that gave them an advantage in every match. The team entered the World Championships in Detroit, Michigan hoping to once again taste Gold on the World stage. After a solid qualifying round, 1114 was ranked 10th and eventually picked by the #1 alliance. They were knocked out of the Archimedes Division in the semi-finals. The team had a lot to be proud of as they were recognized with the Industrial Design Award – bringing home hardware sponsored by General Motors! Even with the technical issues in mind, 1114 was picked 1st overall at all four of their events, continuing the team's long legacy of success.